Two giveaways in one post? That's isn't seen very often! Well guess what, on this entry I am going to talk about two applications by the developer Software Smoothie (iBaby Buttons and Felt Board) and at the end of the post, you can enter to win one of the two applications! 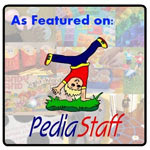 I have already reviewed iBaby Buttons, and I will link to that post, but I have not reviewed Felt Board. So get on board and continue reading for the reviews and giveaways from Software Smoothie! To start off the reviews, I am going to give a brief overview and show some images of iBaby Buttons. I will also link to my previous review. Then, I will do a full-review of Felt Board. Finally, you can check out the giveaways for both apps at the end of this post. The iBaby Buttons application is not only a cause and effect application, it is also great for learning vocabulary! It's as easy to use as pressing anywhere on the screen and a button will appear with a color background! Press the button itself and an image as well as narration will play! Make the button disappear by pressing it once again. This application will keep your young children entertained for hours! In addition, you can customize the application with your own images, vocabulary, and audio. Use it to teach children basic vocabulary, use it for auditory bombardment, or place images of different people on the buttons for facial recognition! Since my review of the application, I used the application with a three year old on the autism spectrum. He got the hang of it very quickly and sure enough, his two year old brother heard us having fun and came over to play! You can read the entire review with more therapy uses, a step-by-step tutorial, and a video of the application in use that I wrote on June 8th, 2012 by clicking here. Who knew that a company could translate creative images that children use on a felt board into an application? 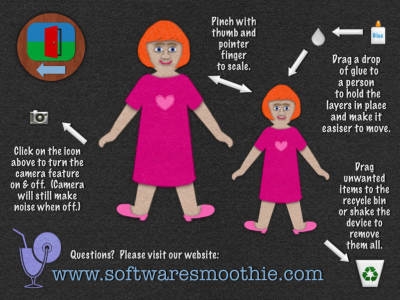 Software Smoothie has done just that! From the different colors of felt to the texture to the gluing process, they have really thought of everything! The application does not have a main page, it just starts right off with a background to place your characters and objects onto (which you can change). First, choose the background at the top of the application. Next, choose which objects you would like to place on the felt board background. You can choose from different people and their clothing/personal items, animals and their food, plants/objects, letters, numbers, and shapes. If you place a layer of "felt" over another layer, for example, if you are placing clothing over a person, you can "glue" the layers together to move them around as one piece by clicking and dragging the glue icon on top of the two layers. If you do not want a piece of felt on your board anymore, click and drag it to the recycling bin. You can move felt pieces around and resize them as well. This application is as close to a real felt board on the iPad as you can get! I love the fact that the textures of the pieces look exactly like felt! It is great to be able to glue the pieces of felt together as if you were playing with a real felt board! The amount of images you can choose from to add to your felt board is perfect for the different backgrounds as well as different people's personalities. Application play is easy to figure out. The fact that once you have re-sized an image and want to put another piece of felt over it, that it changes size immediately to fit the object beneath it, makes it easier to use! Also, when you press on a piece of felt, it brings it to the front. There are characters within the app from actual children's stories including Humpty Dumpty, Hey Diddle Diddle, Little Miss Muffet, and The Three Billy Goats Gruff. You can also create boards for the songs Five Green and Speckled Frogs, Five Little Monkeys, Five Little Ducks, Three Blind Mice, The Eensy Weensy Spider, and Old MacDonald! It may be fun to have the sound of felt being placed on the felt board. I'm not sure if this would be too much sound or too annoying for users, but it is an idea I thought of while using the app. Receptive Language - Talk about the different animal, plant, and object names within the app. 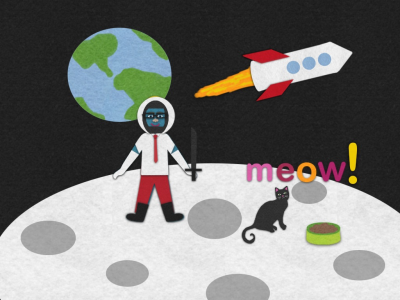 Have children answer questions based on backgrounds such as "what could you find in space?" or "who goes to space?" and have the children answer by placing the object on the background. Also, you can work on categories by asking "what are some other farm animals?" or "what animals can you find in the woods?". Finally, you can talk about how one would dress for different types of weather and have children place clothes on the felt dolls to match the type of weather discussed. Expressive Language - Have a child create a scene and talk/write a sentence about what is in his or her picture. You can even create a picture for them to write about or choose a background to show a simple sentence such as "she is wearing a blue dress". Talk about adjectives, prepositions, actions, and more about the image. You can also have children write or talk about stories based on their images. Social Skills - Place at least two children on the board and pretend as if they are having a conversation. Talk about what they could say to each other based on the setting. Emotions - Use different faces on the felt characters. There are some that portray anger, happiness, and sadness. Discuss the facial cues that help us know how others are feeling (such as eyebrows pointing down or a smile). Memory - Place some pieces of felt on the board or some characters. Then, have the child close his or her eyes and place one in the recycling bin. See if the child can remember which item is missing. Consonantly Speaking was given an application code for iBaby Buttons for the June 8th, 2012 review. 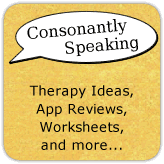 Consonantly Speaking was given an application code for each of iBaby Buttons and Felt Board to give away with this review by Software Smoothie. No other form of compensation was given. ABCs 4 SLPs Upcoming Event - G is for Giveaways!